Hi everyone! Welcome back! I am bursting at the seems with this new release from Pink & Main!!! Not only is it super adorable but it holds a special place in my heart. Anything with bears and puzzle pieces is fun to play with but puzzle pieces and rainbows are also very common in the symbolism for Autism. My son (7yrs old) is Autistic. We deal with joys and challenges every single day and we wouldn’t change a thing!! So of course this set is one of my favs!!! Now keep in mind, this set doesn’t have to just symbolize Autism. That is how I perceive it because it’s my life. This set is great for creating Valentine cards or just something to show how you care. For my card today, I used the To Pieces stamp set. There are so many fabulous images on this stamp set AND coordinating dies too!!! I stamped my images onto Neenah white cardstock using Memento Black Tuxedo Ink. Then I used the coordinating dies to cut them out. I pulled out the one I planned on using for my card and the rest are saved for a future project. 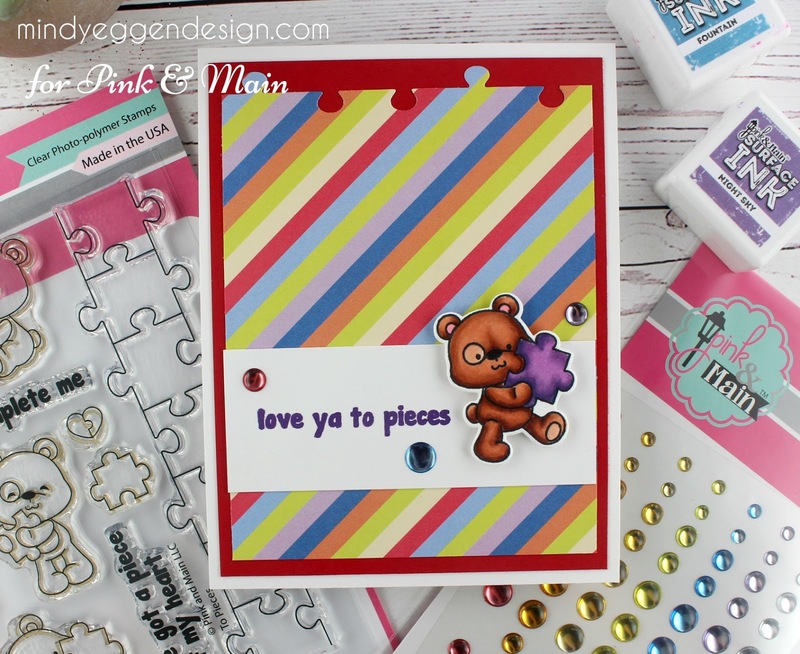 Using the NEW Rainbow paper pack, I cut a puzzle piece border along the top edge with the die from this stamp set. This piece measures 3 3/4″ x 5″ long and is attached to a red piece of cardstock measuring 4″ x 5 1/4″ . I used a white A2 sized card base for my mat. Next, I cut a strip of white cardstock and added the sentiment from the To Pieces stamp set with the Night Sky ink (also available at Pink & Main!) The ink matched perfectly!! My little bear is attached to the card with some foam squares and I finished it off with this fabulous new Glossy Dots!! They are soooo pretty!! I hope you enjoyed today’s card! I had so much fun coloring up these bears and can’t wait to use the again! The new release will be available on February 10th so be sure to mark that on your calendar!